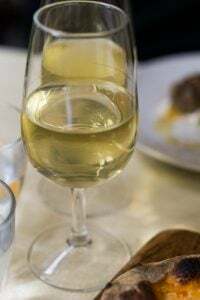 There are some exceptions; gut-busters like Hachis Parmentier (meat pie with mashed potato topping), and Brandade (salt cod puree), are often served with a salade verte, a few leaves of lettuce in a mustardy dressing. But most of the time, the salad arrives after the plat principal. (Curiously, we call the main course the entrée in America, whereas in France, the entrée is the first course – or the “entry” into the meal.) The after-dinner salad in France isn’t usually a complicated affair with tomatoes, eggs, croutons, and all other sorts of other things tossed in with it: it’s often a nice bowl of leafy greens with a punchy dressing. We had a nice dinner in my kitchen, and after the meal, out came the cheeses before we moved on to dessert. But – oops! – I’d forgotten to serve the watercress salad. In the winter, I move from leafy salads to winter greens, like Belgian endive, escarole, frisée, and peppery watercress. I had picked up a big bunch of watercress at the market and carefully washed it all in preparation for an after-dinner salad with the cheeses I’d selected for the night. It was like a gift when I spread out all the watercress leaves on my kitchen counter the next day, and found myself with an abundance of watercress. And as we all know, when life gives you lots of watercress, you make soup. Or whatever. 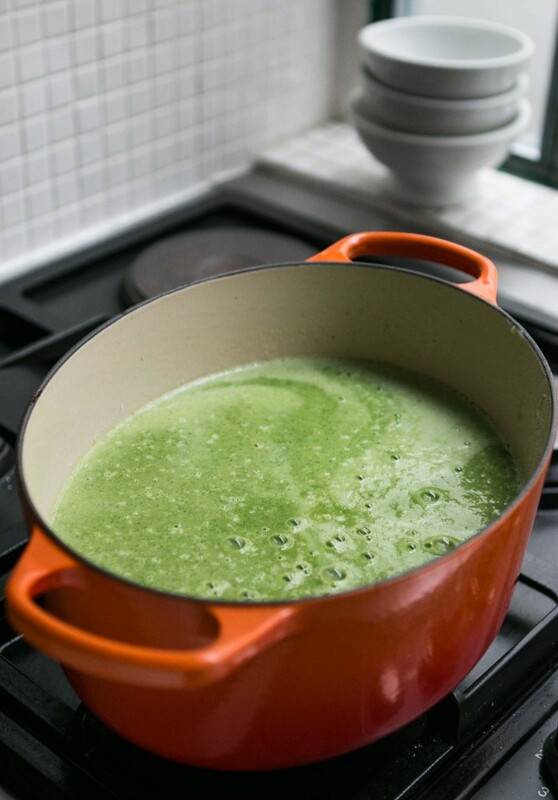 Watercress soup is one of those great soups, like a lot of French dishes, that don’t necessarily require a lot of ingredients. 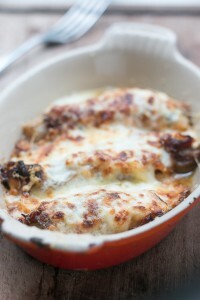 Instead it depends on coaxing flavor out of the few ingredients that you have. Watercress has tons of flavor, for example, so keeping it simple highlights that vibrant green color and zesty flavor of the cress. I cooked up an onion with a big knob of butter until soft, added a few potatoes and simmered until the potatoes were tender. Then I grabbed handfuls of my well-washed watercress to the pot and stirred them in, letting them wilt. 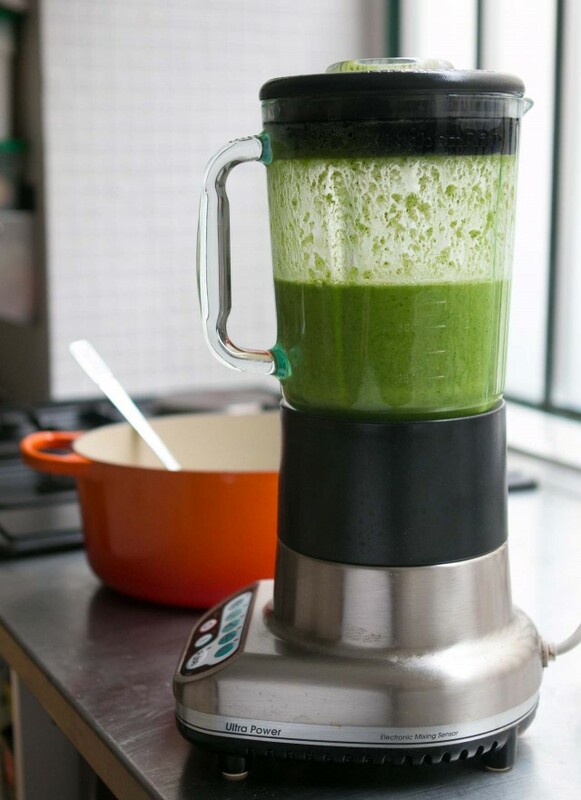 I did throw a curveball into the mix, adding a handful of frozen green peas to give it some extra body and color. In the end, I was rewarded with a nice, colorful pot of soup, which made the perfect lunch along with some of the leftover cheeses I had after our dinner, as well as slices of baguette. 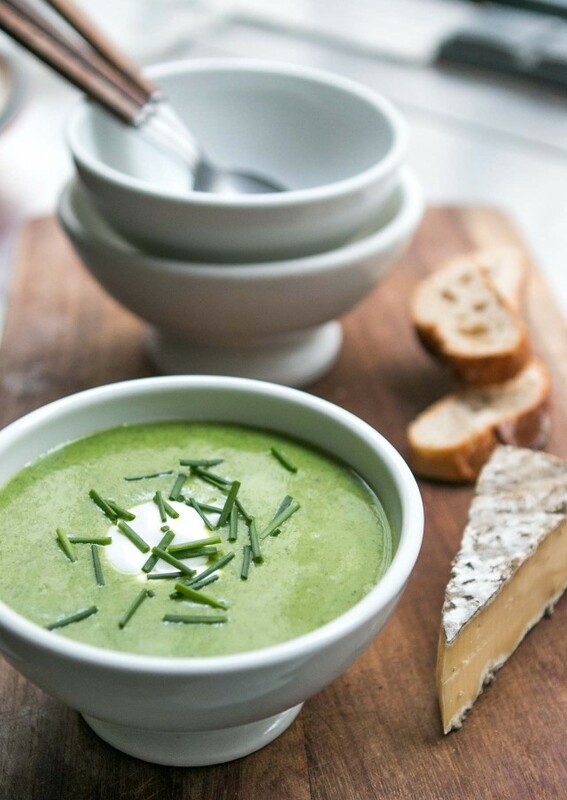 La soupe in parts of France refers to dinner (or supper), and soup is indeed a popular, family style meal in France, especially if served with bits and ends of cheese, charcuterie, and some good bread alongside. But I gotta say, I’m a fan of soup for lunch as well, especially in the winter when I need something to warm me up. And let me tell you, it’s nice to open the refrigerator and find a pot of soup that I can dip into, rewarm a bowl for myself, and spoon up for a satisfying meal. The great thing about simple soups like this watercress soup, is that you can customize it with toppings, to take it in a variety of directions. I liked it with a swirl of goat milk yogurt and chopped chives. Garlic croutons would be nice, as would cubes of crisp bacon. Nuts or seeds, like pumpkin seeds, add a good crunch sprinkled over the top with a drizzle of olive or pumpkin seed oil. 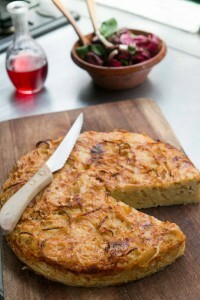 Or you can just serve it as it, with a selection of cheeses (that you might have leftover from guests the night before), and some good bread. Clean the watercress well in a couple of changes of cold water to make sure there’s no grit. You can use all the leaves and tender stems, but any stems that feel especially tough and woody, don’t use. I added peas to give it some extra body and to bolster the color, but you can leave them out if you wish. If you want a creamier soup, blend a few tablespoons of heavy cream or creme fraiche into the soup in step 3.You can garnish this soup in any number of ways, a few I mentioned in the post – from a spoonful of yogurt or cream swirled over the top with fresh herbs, to a handful of seeds or bits of crumbled bacon strewn over the top. It’s your call. 1. In a Dutch oven or soup pot, melt the butter. Add the onion, season with salt and pepper, and cook over medium heat, stirring frequently until the onion is translucent, about 5 to 6 minutes. Add the water and diced potato and cook, partially covered, until the potato cubes are tender, about 10 minutes. 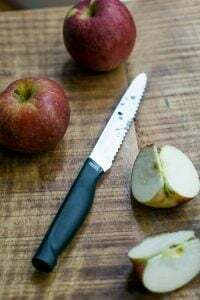 When poked with a paring knife, the knife should meet no resistance. 2. 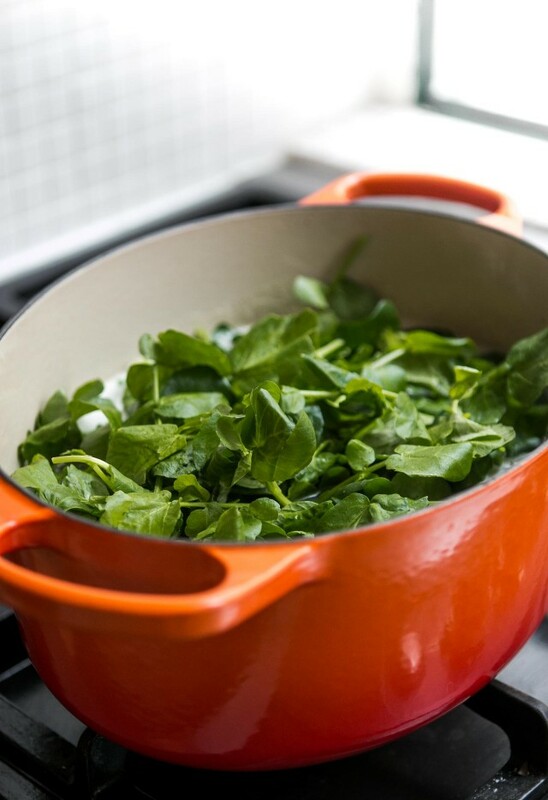 Turn off the heat and add the watercress and peas, stirring a few times to wilt the cress. 4. Once the soup is pureed, rewarm the soup in the pot, season with salt and pepper, and serve. Storage: The soup will keep for up to three or four days in the refrigerator. It can be frozen for up to two months. This soup looks so delicious – what an amazing colour. I absolutely love watercress, so I will have to make it. With regards to salad after a meal, I didn’t know anyone that did this in the UK, until I started dating my boyfriend. 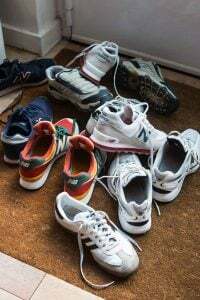 His Mum used to cook dinner and after we’d eaten a salad of green leaves, spring onions and cucumber slathered in homemade dijon mustard based dressing would come out. It’s delicious and now over 10 years later I always serve a salad after our main course – even though people think it’s strange. I remember about twenty or so years ago, going to a “European style” restaurant in New York, and there was a note on the menu above the salad course, suggesting that you order it “after your meal, as a palate-cleanser.” It was funny that they made a point of that but perhaps nowadays, it might seem a little less “exotic”? Even now a lot of restaurants still refer to it as a side salad in the UK and it will always come with the main course. It really works though, it’s a lovely way to round off a meal. The addition of peas seems like a great idea. I get that same craving after having been away from France for a few weeks – great crusty baguette, cheese and the best saucissons. Just ate an amazing saucisson de canard fumé with lunch. Watercress is one of those ingredients I love at restaurants, but don’t think to purchase and bring home. Thanks for the inspiration and this fresh way to use it. Also, after reading this, I am craving le beurre bretagne enough to book a one-way ticket to France! I’ve made Julia’s watercress soup many times, and I like the addition of the peas for color and sweetness. Growing up, we would often have watercress sandwiches on good homemade bread with LOTS of butter, sprinkled with salt and served at teatime by my English/Yankee mother, a tradition I continue. Yum. Hmm, I think I’ll go buy some and make both. Thanks for the idea of using goat milk yogurt! 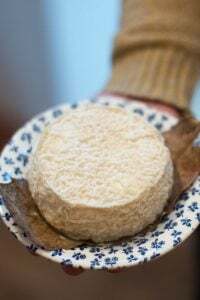 My Frenchman typically dumps in what I consider to be WAY too much crème fraîche, so this is a great dairy alternative. Merci! I’ve heard the salad before dinner tradition started in California. People there were so thrilled that they could grow lettuce year-round that they wanted to show it off! My Italian-American family always had it after dinner. That’s true. When I was growing up overseas in the ’60s, we traveled around America every other summer and saw the salad-before-entree phenomenon migrate eastward. Though I’ve spent my entire adult life in California, I still prefer my salad after the entree. I love this kind of regional food history, thank you! This soup looks scrumptious. 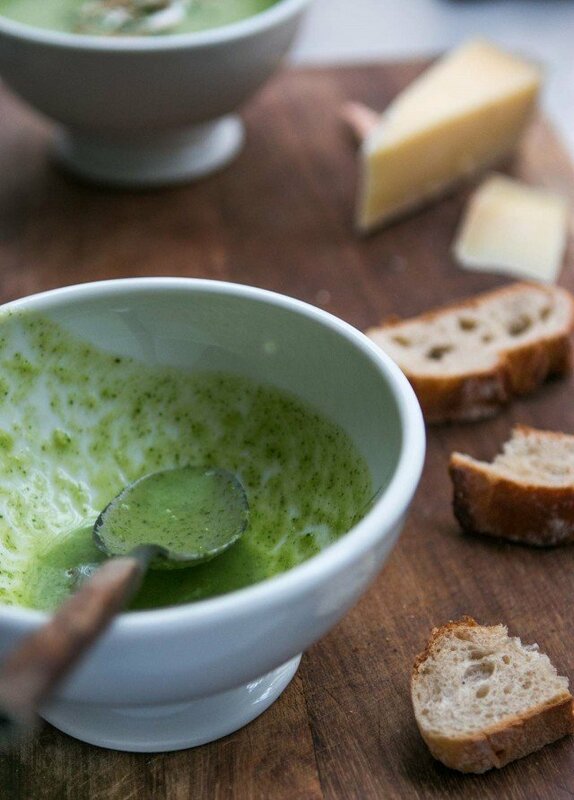 It is pretty chilly in Oregon right now and I just want to cuddle up on my couch with a bowl of this beautiful green soup and a crusty baguette. I love that you compared the use of the word entree in French and English. I just finished reading Dan Jurafsky’s ‘The Language of Food’, and there is an entire section (fittingly called Entree) on the evolution of food language. I highly recommend it to anyone interested in food, or linguistics, or both! 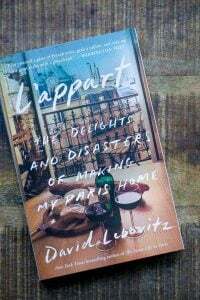 Thank you Jillian for this book recommendation (and David for the recipe but I knew it and just wish I could get watercress here in Milan but it’s pretty unknown! ), it’s on my Kindle now! It sounds like the French serve what we call side salads in America for a course, rather than a “meal salad”. I’ve never been in that fortunate circumstance where I have too much watercress, but if I were this would be the way to celebrate. It looks delicious, and I’m in love with the color. I am from Winston-Salem, N.C. and we had a lovely French Restaurant in the 60″s….La Chaudiere. Very talked about was the simple salad served after dinner and then the cheese cart rolled around. Ah good memories! Btw done soup but used spinach instead of watercress. I’ve been in France for almost a month now and have been working my way through as many cheeses as possible. It really is the best lunch with a great baguette and my favorite dessert! We always had the salad after the main course, it’s a great palate cleanser and makes room for cheese! I read recently that there is a reason Americans call the main course the entree. Back in the time of huge, splendid, many course dinners, the main course would sometimes arrive with a grand flourish and was called the entree. I’m for the ‘salad before or with the main course’, it’s a personal thing but generally, in Switzerland where I come from, it’s a ‘starter’ and often ordered as an ‘entrée’. In UK it’s the typical ‘side salad’ which I was fine with. I live now in F for 8 yrs and have yet to get used to the salad ‘after’…. But I love salad too much to wait until I’m already pretty ‘full’ – so I suffer (very slightly) in silence when eating out and get my fill again when at home. 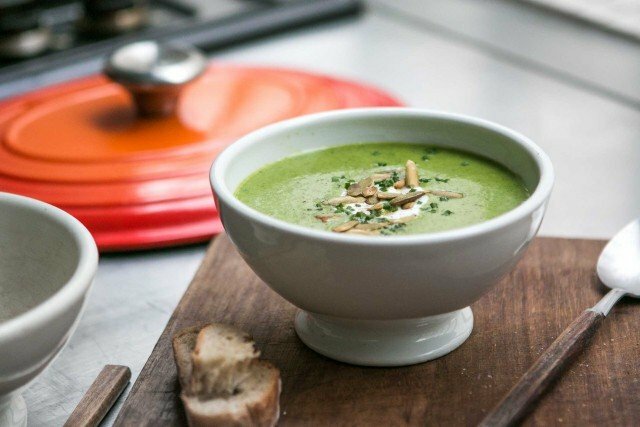 The idea with the added peas is genius; I very often ‘throw together’ a soup (I call them ‘fridge cleaners’) and I add a table spoon full of Greek yoghurt or fromage blanc or sour milk (in Switzie) right in the middle of the filled bol. Looks nice and everyone swirls it in their own way or eats the ‘dump’ on its own before going over to the soup. I’m contemplating a fridge lookover right now; you made me hungry. This is the way I make all green soups, from the first nettle soup in early spring, sorrel soup, chervil soup and others to the kale soup in winter, the last vegetable in my garden. In our house salad was always served at the end of our meal, or with the 2nd course. 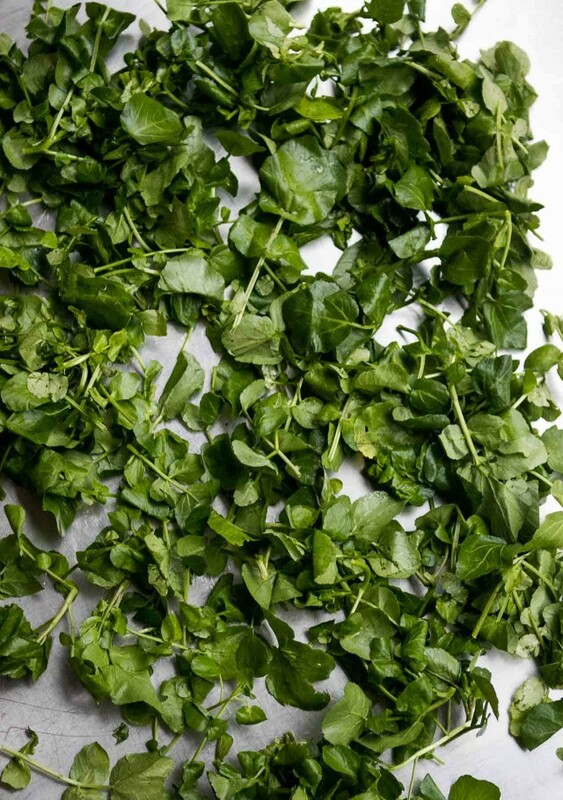 Watercress…something to think about and act on more often. The soup looks very good, of course, but I mostly love how you said you had “a nice dinner in my kitchen.” That sounds so lovely and homey. On a whim I buy watercress for no reason and not knowing what to do with it. And then at that very moment you write this blog post. extrememly serendipitous. Hi David. Thanks for another wonderful post. This one brought back a happy memory of my mother who absolutely loved watercress salad and soup. In the 1950s, my parents would go to small flowing streams in the woods of western Pennsylvania and gather their own! mmm, I have been eating watercress quite a bit last year and this recipe sounds and looks so so interesting. Than you so much for your inspiration and lovely work. Ah I love the color on this. 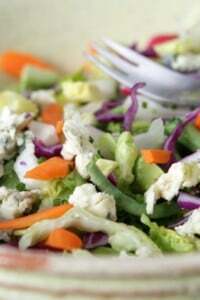 I love the idea of salad after a meal, although I haven’t tried it. It does seem like a nice way to finish off! Ah the perfect fresh green spring is coming, color. I shall buy watercress at the market on Thursday and make your soup. I have some frozen peas, crème fraîche and some great cheeses left over from a dinner party Sunday evening. Merci, David! Speaking of wonderful French butter, is there any butter in the states comparable to French butter ?? Thanks Dave. Yes, Kerrygold is really good butter an available at many supermarkets and Trader Joe’s. What a good idea to add peas! Such a beautiful color, and pea soup is always welcome in my house. 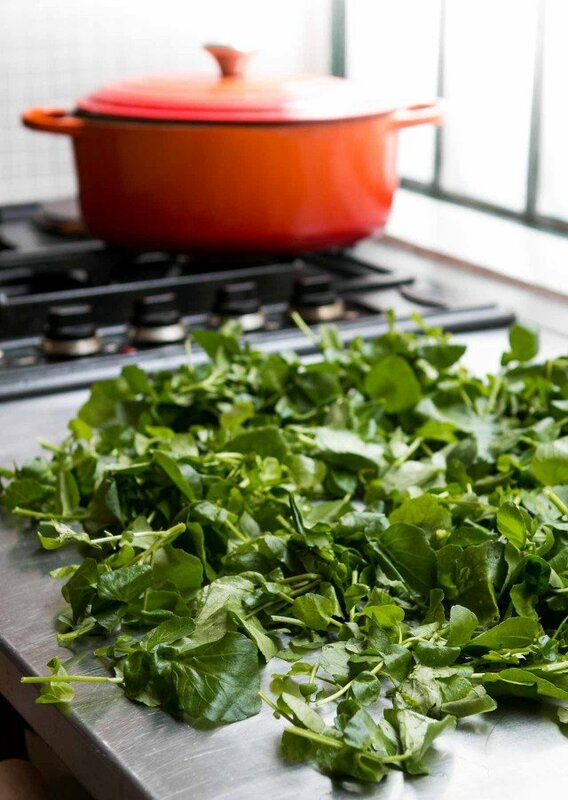 So excited to try this simple, but yummy-sounding watercress soup recipe! Especially since I’ve read seriousscientific/nutrition study that posit that it’s the most nutrient-dense green veggie–more than kale, broccoli, etc.! I had a lovely meal in the country outside of Florence, Italy twenty years ago that ended with a salad. 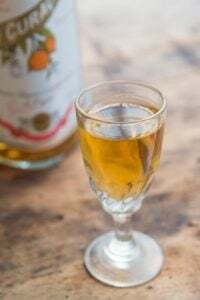 I’ll never forget it and tasted dishes (and drinks) I’d never heard of — fried stuffed squash blossoms, grappa, rosemary sorbet served in a little thimble sized crock…the meal seemed to last forever. Ever bind/thicken the soup with rice blended in instead of potatoes? David, what salted butter do you reccomend here in France.? I’M looking for a good one. Hi David, I love your post -it really captures how special a bowl of home made soup is & what it can do for your soul! We are in soup mode @ taste2taste especially with the recent snow in NY and rain in London. UK/NZ/Aus also call the US appetiser the entrée and the US entrée the main course. Watercress here in NZ used to have a great bite, as did radishes, and now neither of them do. They’re both so bland I’ve given up buying them. I wonder if it’s due to people’s taste moving towards blander/sweeter foods? Whatever the reason, it’s really annoying. If you’re in NZ, Gavrielle, and you think radishes don’t have enough flavor, you’re welcome to raid the ones in my garden. They’re so incredibly peppery that I can’t eat them raw, and this is coming from someone who eats gojuchang like it’s ketchup. Sounds really good. Reminds me somewhat of the Leek and Potato soup that I make. Very simple and can be made very tasty. Chinese restaurants would stir in some scrambled eggs after pureeing, similar to egg drop soup. 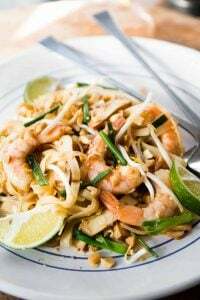 Plus some bits of chopped shrimp, glass noodles and diced tofu. Simple foods with a couple of ingredients…I made leek and potato soup the other night, just those two vegetables, a little garlic and milk – cozy and satisfying on a winter evening. I will try your cress soup. Thank you for the recipe, it sounds good as well as being beautiful. My mom makes a Chinese watercress soup with pork bones. One of my childhood favorites. Since we get watercress year-round here in Thailand this would be something that I could put on my restaurant menu. Looks good and I’ve never done anything with watercress before. I will pin this to Pinterest and will make. Watercrest is very healthy. Look up the benefits. Fights cancer (if you smoke it turns the cancerous parts of smoking into waste), and helps fight infections just like an antibiotic. And full of vitamins and antioxidants. My New Years resolution is to eat more vegetables and eat ones I would not have tried in the past. Thanks for yummy recipe. Yes, if you look at the sidebar, you’ll see a list of Categories, and post (including non-recipe posts) are organized there. My only question is to ask the name & pattern of your soup bowls. They see very elegant & I love the style. Every spring we gather wild water cress along the streams in our area, and it would be perfect to make the soup & serve it in your bowls. Thank you for your recipe.